When Alex Kovalev broke the 1,000-point mark on Monday night, the Russian star made a lasting impression, and then some, when he recorded the milestone. It was, ironically enough, at 10:00 of the first period when Kovalev, playing in front of an appreciative Ottawa home crowd, blasted home his 1,000th career point, a goal that made him the 76th player to achieve the feat and third Russian, along with Sergei Fedorov and Alexander Mogilny, to reach the four-digit plateau. And Kovalev managed to do it in style, shattering his stick in the process, a moment he's not soon to forget. Winning the game made it that much sweeter. Excitement has long been a hallmark of Kovalev's game, a player who didn't take long to make his presence known in NHL circles. His deft stickhandling and deadly accurate wrist shot played a major part in helping the Rangers win the 1994 Stanley Cup. Kovalev, along with Alexander Karpovtsev, Sergei Nemchinov, and Sergei Zubov were the first Russians to have their names engraved on the Stanley Cup. During the 1994–95 NHL lockout, Kovalev played for his hometown team Lada Togliatti, the defending International Hockey League champion from 1994. Kovalev scored eight goals and eight assists in only a dozen games. Fourteen games into the 1998–99 season, Kovalev was dealt, along with Harry York, to the Pittsburgh Penguins for Petr Nedv?d, Sean Pronger and Chris Tamer. He posted 46 points in 63 games with the Penguins and 12 more in 10 postseason games. The next two campaigns were among his best, seasons in which he totaled 76 and 95 points, respectively. Pittsburgh sent Kovalev back to the Rangers on February 10, 2003. He was traded, along with Dan LaCouture, Janne Laukkanen and Mike Wilson, for Mikael Samuelsson, Rico Fata, Joel Bouchard, Richard Lintner and cash. Just over one year later, on March 13, 2004, he was traded to the Montreal Canadiens for Jozef Balej and a second-round selection in the 2004 NHL Entry Draft. He spent the 2004–05 NHL lockout playing for Ak Bars Kazan, in the Russian Super League (RSL), where he notched 53 points in 35 games. Kovalev played for Russia in the 2005 World Championships in Austria, and was named the tournament's best forward. As an unrestricted free agent, he re-signed with Montreal to a four-year contract, worth $4.5 million per year, on August 3, 2005, prior to the start of the 2005–06 NHL season. He scored his 300th career goal and recorded his 700th point on December 20, 2005. In 2007–08, Kovalev, playing alongside linemates Andrei Kostitsyn and Tomáš Plekanec, scored 35 goals and 49 assists for 84 points. He was also awarded the Canadiens' captaincy on two occasions during the season, replacing the injured Saku Koivu in his absence.The following season, in 2008–09, Kovalev was named captain of the Eastern Conference at the 2009 NHL All-Star game in Montreal, and won Most Valuable Player honours as a result of his two goals, assist, and game-winning shootout goal. 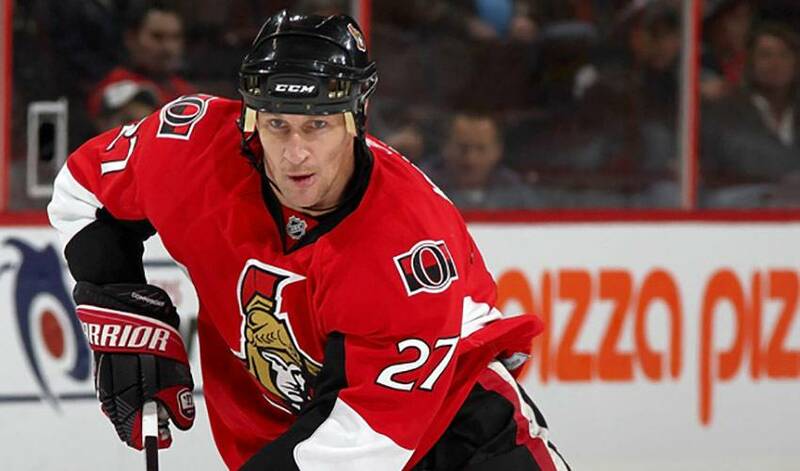 On July 6, 2009, Kovalev signed a two-year, $10-million contract with the Ottawa Senators as an unrestricted free agent. And while he endured some rough moments early in the 2010-11 campaign, Kovalev has been a catalyst in Canada's capital, including his latest accomplishment, one that wasn't only memorable for him, but for his teammates as well. But it's by no means his last milestone. While he has already been recognized by the NHLPA for appearing in 1,000 games and scoring 400 goals, the man who owns a pilot's license is now zeroing in on the 600-assist plateau, sitting less than 20 helpers away. If Monday's stick-breaking performance is any indication of what we should expect, Kovalev will no doubt do it in style.